US-Turkish tensions have grown after government forces put down an attempted coup on Friday night. 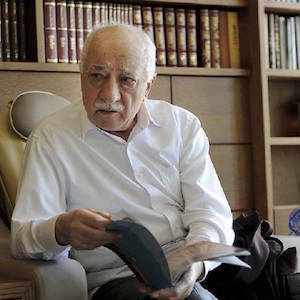 Turkish President Recep Tayyip Erdogan has accused exiled Turkish businessman and cleric Fethullah Gulen of orchestrating the violence and is demanding that the US extradite him. Gulen, who lives in Pennsylvania, denied any involvement and condemned the coup attempt. Secretary of State John Kerry told his Turkish counterpart in a phone call that Turkey needs to respect due process as it investigates those it believes were involved in the plot. At least one senior Turkish official has directly blamed the US for the attempt to topple Erdogan. That prompted Kerry to tell Turkey's foreign minister that "public insinuations" about a US role are "utterly false" and harmful to US-Turkish relations. The exchange comes against the backdrop of Turkey closing its air space, effectively grounding US fighter jets that have been targeting Islamic State of Iraq and the Levant (ISIL, also known as ISIS) forces in neighbouring Syria and Iraq. Turkey has begun a purge of soldiers and judiciary officials allegedly connected to the plot. By Saturday evening, the government had detained 2,839 military personnel, with the number of arrests expected to rise, according to Prime Minister Binali Yildirim. Turkey's top judicial body, the HSYK, dismissed 2,745 judges on Saturday, according to Turkey's Anadolu news agency. Additionally, a senior Turkish official told Al Jazeera that at least two judges from the constitutional court and 10 judges from the HSYK had been detained. Speaking on condition of anonymity, the official said that the judges were detained based on "financial transactions and communications between the individuals in question and the putschists", but added that detention did not necessarily mean conviction. Another senior official, also speaking anonymously, told Al Jazeera that a top army general was also detained over his alleged involvement. "General Erdal Ozturk, commander of the Third Army, has been detained," he said. "Our sense is that the would-be junta had made preparations for some time. They had determined which military officers would take over as governors, heads of government agencies ... but they were forced to rush due to the upcoming Supreme Military Council meeting," he added. The coup attempt began at around 19:30 GMT on Friday with the partial closure by troops of two major bridges over the Bosphorus in Istanbul. "Their immediate goal was to seize control of key areas like the Bosphorus Bridge or Taksim Square," the same official told Al Jazeera. "In Ankara, they tried to storm the Presidential Palace, the Prime Minister's office, the National Intelligence Organization and the Parliament. They also attempted to take down the satellite infrastructure and, in some areas, seized control of telecommunications hubs," he added. An official described Ozturk as one of the "masterminds of the coup".